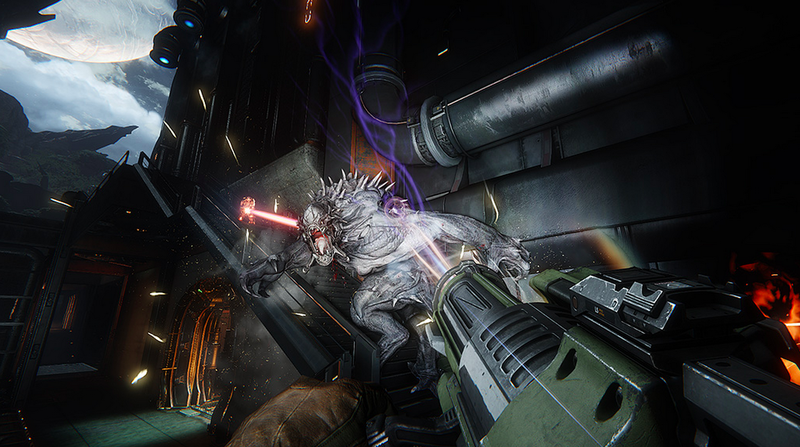 “I very much enjoyed playing Evolve. I’ve been playing this game since it was in alpha and I just can’t get enough of it. I used to be huge on Left 4 Dead and Evolve is the next level of that kind of game play. It’s developed by Turtle Rock Studios so you can see the Left 4 Dead influence but it’s nothing like anything I’ve played. The thrill and adrenaline rush of hunting down a giant monster or playing the monster and having intense white knuckle battles is exhilarating. Each role is very satisfying to play and helps add variety to a simple idea. The only problem I’ve had is more on the technical side of things. I’ve had some driver issues and crashing problems, which I later found out was pretty common. I’m hoping that this will get fixed very soon. I have put in close to 60 hours since I joined Evolve’s alpha and I seriously can’t put it down. Playing as the monster is a phenomenal feeling and getting a group of friends together to go hunt down monsters is a blast. This game is seriously pure entertainment. So yes, I highly recommend it! Cornered the Monster. Let’s take him down! 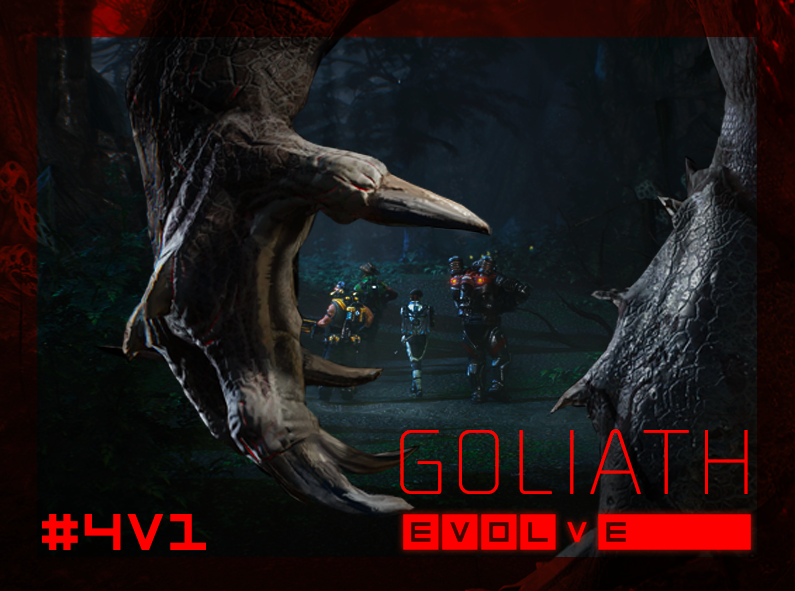 “So far, I have rather enjoyed playing Evolve. I first saw the game at PAX East last year and was initially put off by the booth’s giant statue. My rule at PAX is that the bigger the advertising, the worse the game will be. I changed my mind after watching some people play for a bit and I realized that it looked quite good. I set up an appointment and I got to play the monster, Goliath, in my first game. It was amazingly fun and since then, my experiences with the game have been almost always been great. This is a game that I have gotten really into, for some inexplicable reason. Even though I love playing Evolve, it isn’t completely flawless. There are definite balance issues with some of the Monsters and Hunters. The wildlife in the game can insta-kill you if you do not get help from a teammate, which can be very frustrating. It is even worse considering that I am color blind and cannot see some of the warning colors of the dangerous wildlife. Also, the game is not a lot of fun when playing with a bot, solo or when playing with less than cooperative teammates. If you decide to play the game, I highly recommend playing with a team of friends or as the Monster. When placed in an intensive environment, the game is an absolute blast. But playing in a casual setting with a team of uncommunicative hunters can quickly make the game stale. It’s a game I highly recommend be played with a full team to ensure a good time. On the other hand, when playing as a monster, you can easily take advantage of four strangers who don’t communicate or know each other’s play style. This makes it the ideal role to play when matchmaking by yourself. If you get a competent team to play against, it only gets more interesting as the Monster. The aspect that makes each set up different depends on your intensity. 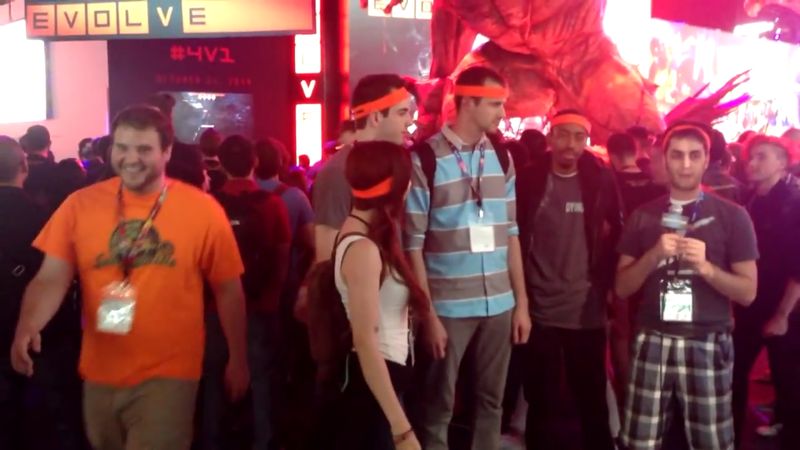 I had the pleasure of competing in the Evolve tournament at E3 alongside the team from Nerdist, as well as many prominent gaming YouTube personalities. The great thing about this game is that when intense things happen, they’re either hilarious or incredible. I recall watching an entire team get eaten and killed by AI early in the game giving the monster an automatic win. It was hilarious, and the crowd and stream went crazy! My personal favorite moment was being the last one alive and running from the monster at an attempt to beat the clock to respawn my teammates. At zero seconds, I died, but not before respawning my teammates. I stood up and screamed in the Evolve booth in celebration! The irony though, was that the monster (Malik Forte from Nerdist) destroyed the generator within 30 seconds and we lost. Such a mixed day of emotions! This is a game I do not regret purchasing, but keep in mind that you will be playing with a team, and your goal should be testing out new strategies. If you decide to play as the monster, destroying people is incredibly gratifying. Thank you, everyone, for taking the time to review Evolve. This game was developed by Turtle Rock Studios and was released on February 10, 2015. It is available for PC, PS4 and Xbox One. If you want to stay updated on more Gamer Compatible reviews, you can follow us on Twitter: @gamercompatible or on Facebook: @gamercompatible. All images were taken from Turtle Rock Studios and LEGIQN. This entry was posted in Reviews and tagged E3, evolve, game, gaming, generators, hunters, insights, monsters, reviews. Bookmark the permalink.